The Obama Administration has announced an intended 28% reduction in CO2 emissions in the United States by 2025. How this reduction against the benchmark year of 2005 is to be achieved was not explained. What follows is an analysis of how it might come about without resort to renewables but, rather, the expanded use of cheap natural gas and further government regulation. The total and individual sources of CO2 emissions in the US are shown in Figure 1 as estimated by Carbon Dioxide Information Analysis Center (CDIAC). The target reduction is also shown as an intention. 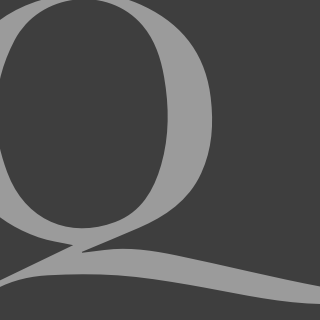 In order to see how this target might be reached a goal must be set for each emission source. This has been done on the assumption that the growth in gas use continues and that gas continues to replacing coal for electricity generation and other industrial processes. This displacement is shown for energy generation from coal and natural gas sources in Figure 2 (below), as compiled by the Energy Information Administration (EIA). 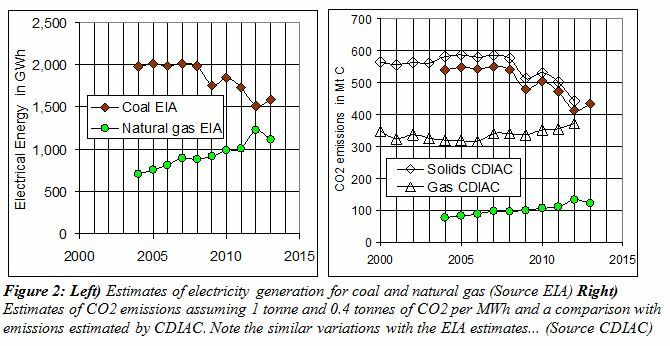 The conversion to CO2 emissions is seen to follow the pattern of the CDIAC estimates but also shows other contributions to emissions from both solid fuel and gas use. As a consequence of the displacement of coal, the reduction in solid emissions is determined by the rise in gas emissions. The significant remaining source is liquids (mostly crude oil), the balancing item in setting the individual source targets to meet the intended total reduction. The results, assuming that the lowest emission generators used, are combined cycle gas turbines so that emissions would be reduced by 60% is shown in Figure 1 and in Table 2. The significant point of this approach is that the change from coal to gas is being driven by reduced electricity generation costs but achieves a large part of the target-emission reduction. The continued expansion of natural gas use is an optimistic assumption but shows that significant changes would need to be made in decreasing the uses of liquids. 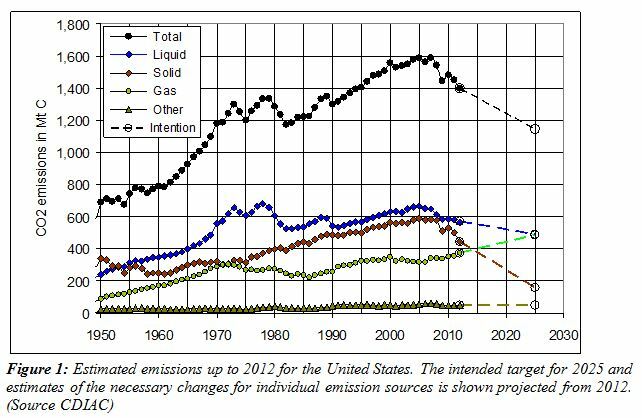 On the other hand, the emission estimates for liquids (Figure 1) show no declining trend over forty years. Thus the only means of reducing the use of crude oil is through regulation. In summary, the 28% emission reduction is based on a classic market economy achievement — the replacement of coal by cheaper natural gas for electricity generation. This is a textbook example of innovation not driven by tax or subsidy. However, regulation by the EPA making it difficult to expand or build new coal-fired generators must reinforce the switch to natural gas use and EPA regulation for industry and transport emissions might then curb the use of crude oil. 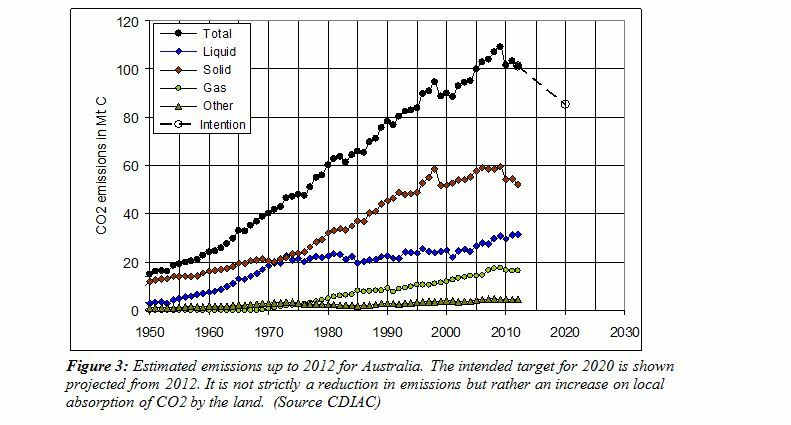 The Australian total and individual sources of CO2 emissions are shown in Figure 3, as estimated by CDIAC. Australia has a different energy mix due to low-cost coal resources for electricity generation. So a US-style approach of shifting to gas will not be easily achieved, as gas is more costly than coal as an energy source. The target reduction is also shown for the Direct Action plan, which targets a 5% reduction from the emission level in 2000 by encouraging plant growth and subsequent CO2 capture in soils. This target is thus not comparable to the Obama plan, as it is a net reduction after gaining “carbon credits” available under the Kyoto protocols. Compare and contrast: the Australian approach is to increase removal of emissions by encouraging plant growth, while the US is relying on the switch from coal to cheap natural gas. By 2025, China’s emissions may be three to four times that of the US, and India’s emissions may well be their equal. So much for effective policy when the developing world will more than double its present emissions. Both approaches — those in the US and Australia — might have been described by Sir Humphrey Appleby as “courageous”. The approach by both countries is still saying that CO2 is a problem when no matter what they envision as an answer will not have any effect on the climate of this planet. The arrogance of the Green Blob to believe that they can make the climate to suit their plan is wishful thinking.